Scholarship Amount: Up to $1,500 per year. 2019 Ruth Krehbiel Jacobs Scholarship Application (online submission only) - Please read all information and directions before submitting. 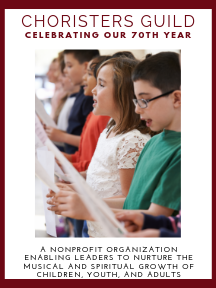 Established in memory of Ruth Krehbiel Jacobs, founder of Choristers Guild, the Scholarship Fund provides financial aid to full-time students preparing for church music ministry. An applicant must be a junior, senior, or graduate student majoring in music, whose primary interest is choral music with children and youth. Scholarships are given on the basis of academic merit, interest in church music (especially children's and youth choirs), and ministry of church music as a vocation. Incomplete applications will not be considered. All supporting documents (letters of reference, additional documents) also must be received by the application deadline for your application to be eligible. Be a music major with choral church music as a primary interest. Be registered as a junior, senior, or graduate student in an accredited university. Demonstrate talent, leadership ability and promise of a future in church music. Only applications received through our online form, along with supporting documents, by the deadline of February 1, 2019 will be considered. A number of partial scholarships are available for Choristers Guild Institute attendees. The Choristers Guild Institute is a week-long, three-stage residential summer training program for leaders of children's and youth choirs (K-8) in churches and church schools. The Insitute is designed to strengthen directors’ musical and pedagogical skills and to equip them to effectively integrate children in worship. Applicants must register for the Choristers Guild Institute with a deposit of $200 by February 1, 2019, in order to apply for scholarship funds. Applications must be submitted by March 1, 2019. Recipients will be notified by April 9, 2019, of award or regret. Those who display a commitment to children's church music and have a history and/or future plans to minister as a church musician. First-time attendees at the Choristers Guild Institute who pledge to attend in future years. Returning participants who have demonstrated exceptional work at the Institute in previous years. Practicing church musicians with evidence of experience in a sustained position. Only complete applications submitted through our online form by the application deadline will be considered.